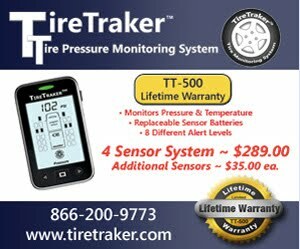 Is your TPMS warning psi set correctly? Originally Posted by Dan O. "The 'Safety Steer' is definitely a good bit of insurance. I also run the tire monitor system on all six MH tires and the four race trailer tires. I run 110 pounds in the coach tires and did pick up a nail in a steer tire one day. At 80 pounds the tire alarm went off (handling felt the same) and I saw 40 degrees more temperature in the low tire. Point is, some other warning signs are sometimes there before you experience an actual blowout." I suggest you change the warning psi level. Many TPMS come with a single warning after a loss of 20% from the cold inflation. 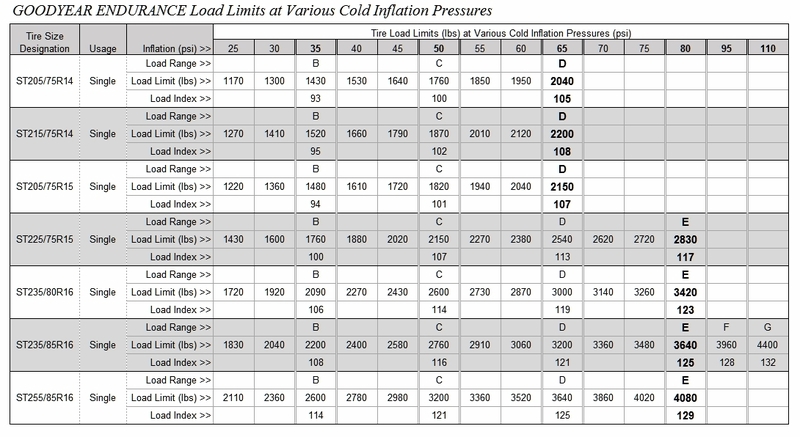 We all know that when running, tire inflation can increase 10 to 20 % from the CIP (cold inflation pressure). I would suggest that if your CIP is 110 then the warning should be no lower than 100. Some TPMS provide early warning and alert when the hot pressure has dropped faster than normal so you can gain seconds to minutes advance warning if the TPMS provides "rapid air loss" warning or some other warning based on the hot pressure. Based on weight my small Class-C needs at least 65 to support the measured load. I use 75 as my CIP and my warning level is 65. My normal hot pressure is 80 to 85. If I pick up a nail I would get a warning if a tire looses more than 3 psi in a couple minutes so I might get a warning at 77 to 82 psi, which is well above the minimum needed by the tires for the actual load. 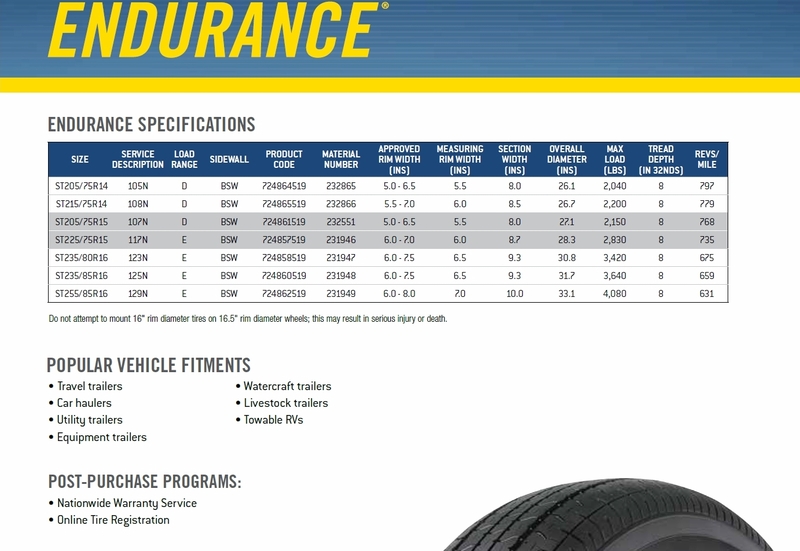 If a tire loses 20% of the air needed to carry the load it is officially "flat" for warranty purposes so there is a potential that the driving as Dan did with the tire down at 88 was damaging the tire structure which could shorten its life by months or years. According to the U.S. Tire & Rim Association the warning signal from your TPMS should go off if inflation ever drops to below the level needed to support the actual load on any tire. "I am a newbie. Just 5 weeks with my 2017 Newmar Bay Star 3113. I need some help understanding just what would be the correct or appropriate tire pressure on my coach. When loaded with my wife, dog and self, partial food and clothing, tools, chairs, BBQ ladders, 2/3 water, full gas and propane and misc stuff I got the following from the CAT scales: Front axle - 7,300. Rear axle - 13,260. Here is my dilemma: The dealer delivered the coach with about 85 lbs. per wheel cold, but when I use the Michelin tire pressure chart for my 235/80R 22.5 XRE tires they should be just 75 lbs! I am concerned that they will be "underinflated" and could build up excess heat. Should I keep the 85 lbs. or lower the pressures?" David, Welcome to RV fun. For all things tires (except buying) I obviously suggest you check my blog. I don't expect folks to remember everything but if you spend a few minutes checking it out you will learn how to use the "Label List" on the left to find a post of the topic of interest. There is also a search box in upper left. Now to your specific question. 1. We want to know the heaviest load on your tires and since few RVs are perfectly balanced side to side for weight we ideally want to know the "4 corner weight" to learn the heavier end for each axle. Lacking knowing that number, IMO, we can do a rough calculation by using 53% of the axle scale weight for the RV when it was fully loaded (the expected heaviest it will ever be). 2. 53% of your front would be 3,870# and rear would be 7,030# or 3,515 on each dual. 3. Looking at the Michelin load tables we find for your size at 85 psi can support 3,975 for single (front position) and 80 psi supports 7,050# for two tires in dual position. Yes, we always round up. 4. Based on the above, your MINIMUM inflation would be 85/80. This is the number I would use for the low pressure warning numbers on your TPMS. 5. 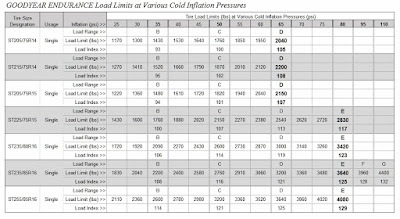 I recommend adding 10% and again, rounding up, that means 93/88 psi for your Cold Inflation Pressure or CIP. In your case, given the close numbers for the front load, I would be comfortable using 90 psi all around, as a single number is easier to remember. This 10% gives you a nice cushion so you do not have to chase your tire pressure around whenever the temperature rises or falls. You could even get down to 85 psi before needing to "top off" the tire pressure again. 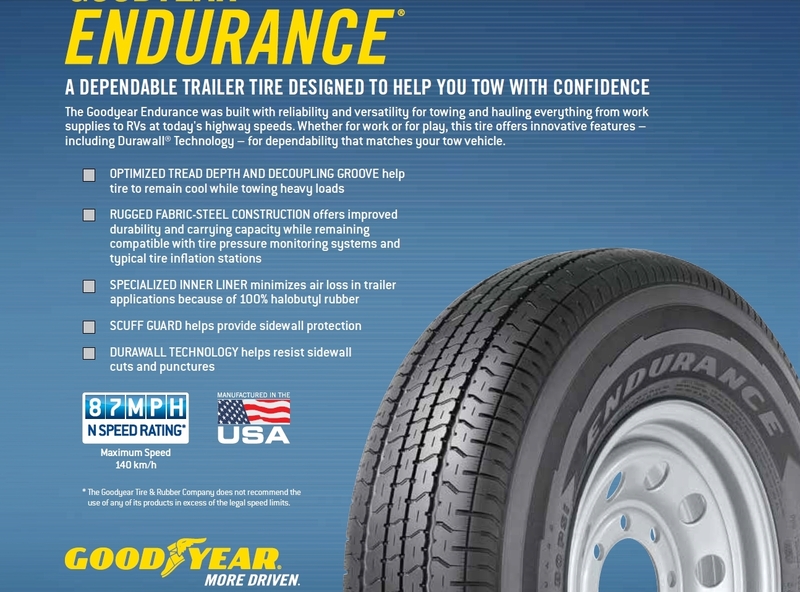 6 All tires on an axle should be inflated to the same level for improved handling and response in an emergency situation. 7. I would set the TPMS High Pressure warning to 110 to 115 psi and your high temperature warning level to 160 F.
8 Remember CIP means when tires are at ambient temperature and have not been in direct sunlight or driven on for at least two hours. Finally, in your case, you are close to some numbers when we round so if your RV is more balanced than my suggested 47/53% you may be able to lower my suggested inflations by 5 psi, but only when you confirm your heavier end is less than 53% of the total. Why do some tires "explode"
OK, let's see if I can cover the details of why and how a tire sidewall fails due to being run without proper inflation. 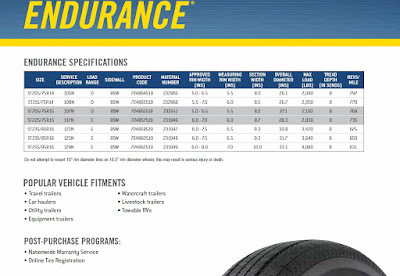 The mechanics are essentially the same, be it a textile (usually Polyester) tire, as are most P, LT, and ST type tires, or for tires with steel body cord, as most commercial grade LT tires and "TBR" "Truck-Bus Radial" tires. These cords are referred to as the "body ply." I think we all realize that tire sidewalls bend when loaded. This can be observed by simply looking at the bottom (near the road) vs. the rest of the tire sidewall. The amount of bending is essentially just a function of tire size, load and inflation. This bending includes some stretching of the outer surface of the tire and of the rubber surrounding the body ply. This stretching results in some heat being generated. You can test/experience this heat generation yourself with a simple test of holding a rubber band against your lip and stretching and releasing the rubber band. Your lip is sensitive enough to feel the temperature rise of the rubber band. Now the rubber used in tire construction can tolerate some temperature rise. The heat generated can transfer to outside air at about the same rate it is being generated. This is what happens for hopefully tens of thousands of miles and hundreds of thousands of revolutions, i.e., sidewall flexes. So what happens if there is a leak of inflation air, or if the tire was not properly inflated in the first place? With lower air pressure the amount of bending increases and with an increase in bending we see more heat being generated. Increased heat generation means increased temperature of the rubber internal to the tire structure. Since rubber is a good insulator, heat transfer can be slower than heat dissipation to the outside air, so the temperature can continue to rise ever faster. The strength of the rubber decreases with an increase in temperature, which allows more bending. With slower heat transfer from the internal structure to the outer surface and increased heat generation as more air leaks out, I think you can see how it is possible to get to a point where there is something like a chain reaction or "runaway" temperature increase. The above heat generation can also result in the polyester experiencing a rise in temperature with the associated loss of strength. You have seen the effect of high heat by holding a match near the end of a piece of Nylon or Polyester and see the textile melting. In the steel body ply tire the increased bending can result in a fatigue failure of a steel cord. You can test the fatigue with a steel paperclip. Simply bend the paper-clip a few times and it will break. In the case of a tire, the number of bends to failure can easily be in the thousands. I will cover the "explosion" in an upcoming post. First video is of overall process of manufacturing a tire. Next is how tires (in this video from the 1930's) were made. Then how larger farm tires were and in some cases still are made. Bias tires in U.S. in '60s and in third world countries today. State of the art tire assembly machine. This would be what you would see today for passenger and LT. The process is similar for truck (RV) tires being made today with just a little less automation by top tier tire company. And I bet some just thought rubber was squirted into a mold.